Question at the outset: Hulu introduced a new commercial free version of its subscription service for $11.99/month. Is the new pricing based on the share of value to customers or the need to offset lost Ad revenue? For those cutting chords (figuratively speaking) – removing cable TV option and satellite TV – Hulu has been the go to option to catchup on TV shows. For $7.99 a month subscription fee Hulu offers its customers current and full season episodes of most popular TV shows (some network exceptions apply based on their content licensing agreement). Seems better option to customers than paying cable TV bill or struggling with Over The-Air Antenna. What viewers get for the price is unlimited and on-demand streaming of TV shows. Just like a TV show is interrupted by commercials (even in the pay-Cable ones) viewers see commercials. Sometimes these are the same that aired with the show and other times different ones inserted. But the experience is the same – 30 minute sitcoms and 60 minute murder mysteries filled with 10%-20% commercials. Some of those paying customers are not too happy to be interrupted by the commercials – limited or not. Clearly demand for such Ad free TV shows exists, Netflix and Amazon are quite successful even though they do not offer current episodes like Hulu does. Seeing this pressing customer need to be not interrupted Hulu is introducing a No Commercials version at a price of $11.99 per month. The price difference is $4 for no interruptions. I have always said many times before, “If one price is good, two are better“. So isn’t this better for Hulu and its customers? The answer is a qualified yes. We need to consider the reasoning and logic behind the $4 price difference for no interruptions. Is that based on customer research and value they assign to for interruption free TV shows (hopefully done using some kind of conjoint analysis)? Or is the pricing done to offset the lost revenue from Ad sales from the premium version? In case 1 it may see the need to keep ARPU the same and may simply came up with a price point of $11.99 which is likely its ARPU. In case 2 it may see the erosion in Ad revenue, model possible uptake and come up with per user uplift in pricing needed. That is they are using case 2 above and modeled in small enough uptake of new version and shaping that expected customer behavior with a higher price tag. It is perfectly normal and acceptable effective pricing practice to shape customer behavior with higher price point. For instance amusement parks set a high price for Fast Pass and other similar options to skip lines to reduce uptake. After all if the price is low enough and many take it the lines at FastPass will degrade value to customers. But using higher price point just to support a model assumption on Ad revenue loss without measuring customer value is simply not effective pricing. When it comes to pricing your first version or the second version the right place to start is with customers, not your costs and revenue goals. 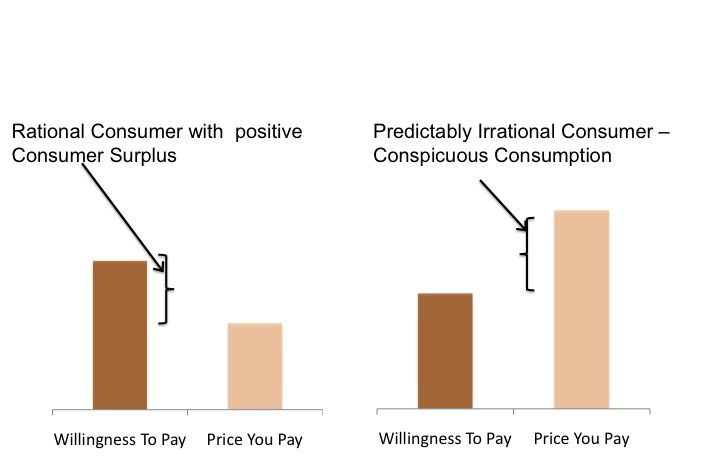 If one price is good, two are better if both are based on customer value and not costs. In one of the small business success stories featured in GroupOn website, Director of Melt Spa and Salon in Boston tells us about her success from running GroupOn promotion. Her original expectation was 200 people but the promotion brought in 1400. When you open a premium Spa and Salon or any similar business that offers premium product at premium prices, your strategy should be to target specific segment of customers who are similar in their profiles. Most importantly you want a customer mix that hires your product for the same set of reasons. A customer buying $125 haircut is hiring the product not just for what the product is but for a basket of reasons. There are utilitarian reasons and then there are other (hedonistic) reasons like brand, experience, ambience, social status and most importantly other customers. Perception of profiles of other customers is a key decision factor because it tells them about their own profile. We all tend to look for social conformity in our choices. If a GroupOn promotion brings in 1400 new customers, from students to business people to grandmas who came in only because of the steep discount, what message will it send to your core customers? Will the big change in customer mix negate a key reason your pre-GroupOn customers hired your product for? I have nothing against grandmas; the point is your loyal customers may take away a different message about the product when they see a sudden change in customer mix. Acquiring 1400 new customers who paid $50 for $125 services is not all bad but you lose control of your customer mix. Instead of targeting all its 25 million email subscribers, can a Group Coupon site enable you to specify the exact customer profile that you want to reach? Is the end of free online newspaper nigh? I love reading NYTimes online version and love the fact it is free. Every time I read it I feel like I should click on the Google Ads on its news pages. Rationally it makes no sense for me to do that, and I don’t click, because it is not enough that I click on the Ads if not many are going to. If NYTimes wants to give their content to me for free, I am only happy to consume like any other reader. Unlike Financial Times and Wall Street Journal many online newspapers like The New York Times are free. They exclusively rely on page views to drive Ad revenues. As the Ad revenue shrinks, the free model is proving to be a bad one. end distribution of free Web content and make our news-gathering capabilities a service for our customers. He is absolutely correct, the line of thinking that news has value and hence customers should be charged for this regardless of the distribution medium is slowly taking hold. If the online version of a newspaper has been free all along, can it successfully convert the readers into paying subscribers? If the newspaper can gain more incremental revenue from subscription than it receives from Ad revenue today, it is the right decision. But how can it convince readers to pay for something they always received for free? It’s not like I don’t value it. I just don’t have to pay for it, on screen. Of course the question is not whether we value are not, we all value the service we get from Newsday or NYTimes despite the $0.00 price. It is also not the question of communicating this value. Like Tom, most readers will not accept the transition from fee to free model because of their reference price frozen at $0.00. So if the NYTimes or Newsday want to charge for what used to be free they need to focus first on impriving this reference price. To answer the question, will Newsday succeed? Without any move to improve customer reference price, they are not going to find it easy to convert customers from free to fee. Take the case from airline industry. US Airways started charging for coffee and soft drinks in their flights but after seven months they decided to rollback their unbundled pricing. My recent consumer behavior experiment shows that such a move would have been successful if they had considered improving customer’s reference price. Reference price rule applies to valuing any service and especially with valuing free. WSJ and FT.com has it easy because they never made their online version free. For everyone else who want to move to fee model, “it is the reference price, stupid”.